I really enjoy my job. I am not in the job market. I spend time nurturing my professional networks. For some people, one of these things is not like the others. They have the mistaken impression that networking is something you do when you are looking for a new job, or for some other work-related favor. For me, building and nurturing professional networks has been one of the most rewarding aspects of my career. Looking back, I can see how my professional development has been enhanced by involvement in academic and human resources organizations. In addition, I can identify at least four groups where I was able to learn new things and make long-term professional friendships (shout-out to Communicators Forum, Women’s Leadership Institute, Project and Change Management Collaborators, and Art of Hosting mates). These were participant-driven organizations where people worked together to support each other and make a difference in their organizations and the wider community. For example, I formerly was an HR consultant at the University of Minnesota and worked with many groups that were experiencing change. Other colleagues worked with change-related projects from the IT and Facilities viewpoints. We were all seeing part of the picture, and there was a lot of wasted energy and rework. A few initial conversations eventually led to a vibrant group that still meets monthly to share ideas about leading change, develop common project management tools, and collaborate on overlapping projects. This new way of working together proved very effective. I understand why our MnSCU leadership competencies include “networks with innovative thinkers, developers, and donors.” Reaching outside of our normal circles can provide new insights, as well as build the foundations for mutually beneficial collaboration. 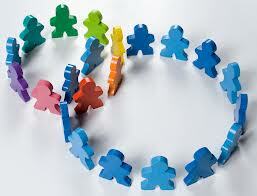 What have you done recently to build and nurture your professional networks? This entry was posted in higher education, Innovation, Leadership and tagged higher education, Leadership, leadership development. Bookmark the permalink.